The AutoExec GripMaster 01 car desk’s versatile top surface is designed for writing, paperwork, and laptop or tablet use. Customize your car desk with a power inverter, mobile phone mount, or printer stand for a productive mobile office experience. The AutoExec GripMaster Car Desk with Pull Out Writing Surface features a pull-out writing surface with built-in clipboard, which provides a convenient area for doing paperwork and writing. The large storage area underneath is great for office supplies, a laptop and other valuables you might want to keep hidden. Additional storage compartments hold small supplies such as pens and pencils. The AutoExec GripMaster Car Desk with Pull Out Writing Surface can be accessorized with a power inverter (built-in), cell phone mount and printer stand. This versatile car desk model is ideal for those needing to keep mobile equipment accessible during the day as well as needing a convenient area for writing. Using just a seat belt, fasten your car desk securely to use in your car, SUV, or Mini-Van. Dark grey body with light grey work surface. The AutoExec does not come with a power supply. This power supply can be installed in any AutoExec model as an additional accessory. When placing your order, you can add the built-in power inverter from the drop down options above. The desk will be shipped to you with this power inverter installed. A built-In, high speed cooling fan helps keep the unit cool and there is an On/Off Switch and LED Indicator. Ideal for running computers, cell phones, lights, stereos, radios and CD players in cars, trucks, 2 USB ports and 2 AC receptacles. Our printer stand uses a unique, spring loaded mechanism that holds strong, yet provides easy removal for printer storage. At each end of the spring loaded cradle are small clamp plates that are designed to fit cleanly around either edge of the printer. 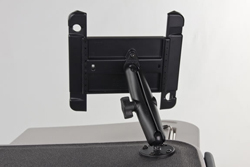 The Universal Cell Phone Mount Cradle: Holder features a multi angle ratcheting pedestal and side grip ratcheting mechanism that's controlled with a simple push button release. Your Cell Phone will be held securely in place by the soft, cushioned, side grip arms of the cradle. When you want to remove your Cell Phone from the cradle, simply press the push button release. Get the most out of your tablet with the universal tablet holder. With interchangeable cup ends, you can fit the holder to your tablet for a near custom fit. This spring loaded design makes it easy to load and unload your tablet, along with keeping it secure while on the go. Cup ends are designed to optimize the functionality of your tablet, allowing access to audio jacks, USB power, and other ports. Your tablet can be used just as it was intended. Tablet Mount Specs: The universal mount is compatible with Apple iPad 1 and 2 and any tablet that will fit the cradle dimensions listed below. Width: Maximum width to 7.75"
Support cups contain open slots to accommodate for tablets of various sizes in thick rugged sleeves, cases, bumpers, or folders. Hook the WheelMate to the bottom of your steering wheel while parked and you have an instant desk surface. Great as a writing platform or can even be used as a tray for eating on the go. Measures 15" wide and comes out 8.5"
The Gripmaster Mobile Desk is a flexible solution for working with a combination of technology tools and paper files in the vehicle. The top surface of this desk is covered with a rubber non-skid material, which ensures that a laptop, briefcase, PDA, or cell phone will keep from sliding while the vehicle is in motion. This GripMaster features a pull-out writing surface with built-in clipboard, which provides a convenient area for doing paperwork and writing. The large storage area underneath is great for office tools and accessories and also for keeping a laptop out of sight. Additional storage compartments hold small supplies such as pens, maps, etc. Don't drive distracted. Use computers only while parked. Click the button below to add the AutoExec Desk GripMaster-01 with Pull-Out Writing Surface, Gray to your wish list.